Mitutoyo Magnetic Stands, shown on these pages, accept all AGD-type Dial Indicators. 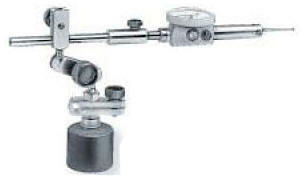 Test Indicators and Probes having 3/8" DIA. shank and/or Lug Back with 1/4" DIA. mounting hole. The ON-OFF Switch offers instant mounting and dismounting without any adverse effect to the indicators or work surface. 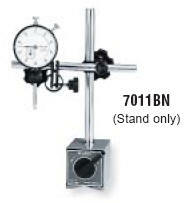 Very small magnetic stand permits use of Dial Indicators and Test Indicators in very confined areas. The stand features fine adjustment. Dovetails are accepted by the part shown in the drawing on the left; which also locks on to rods for mounting stems of .250" DIA. The extra rod will accept mounting stems of 5/32" DIA. at one end.